Join the Maryland Sponsor-A-Highway Program! Each year, the Maryland Department of Transportation State Highway Administration (MDOT SHA) spends millions of dollars to remove litter and debris from our roadways, which can create safety and environmental hazards for motorists, cyclists and pedestrians. Litter removal also forces SHA staff to commit time, and money to this effort when they should be concentrating on highway safety. The MDOT SHA Corporate Sponsorship Program allows companies to sponsor sections of Maryland roadways. The Sponsor enters into an agreement with a 'Maintenance Provider' for litter and debris removal from the sponsored segment. The maintenance providers remove trash from the sponsored segments of roadways. 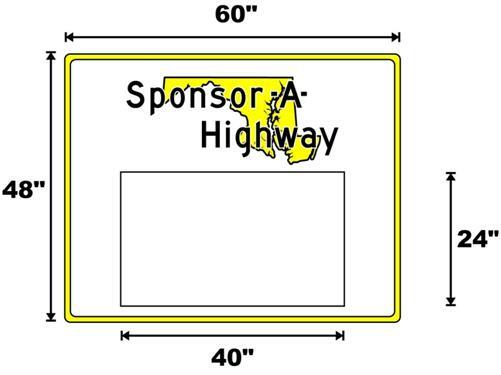 As part of the highway sponsorship, the sponsoring group will receive an acknowledgement sign with corporate logo along its segment. Maryland joins other states — including Delaware, Connecticut, New Jersey, California and Colorado — in this national effort to reduce litter along its roads. Interested in signing up as a sponsor? Call both providers below to obtain quotes — they are equally capable of handling your questions and business needs. Adopt A Highway Litter Removal Service of America, Inc. Thank you for joining Maryland in its environmental stewardship efforts!